If I were writing my mega-essay on reggaeton today, I’d want to make a lot more space for the Dominican Republic’s local take on the genre. 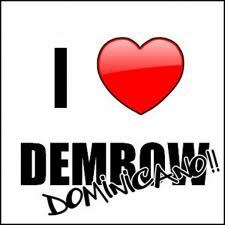 And that has only gotten truer in the 8 years since, as Dominican dembow has continued to grow, change, and gather steam, including outside of the DR. So I was thrilled that People en Español’s CHICA decided to devote so much space to the genre last month. Jennifer Mota has written the definitive piece on the genre, and while I did provide some quotes and Jenny generously cites my research, it’s a piece that I would recommend whether or not you’re a W&W fan. Among other things, the article is careful to place Dominican dembow in the longer transnational story of reggaeton, from Jamaica to Panama, New York to Puerto Rico, while also showing how the genre has taken a distinct path from its Puerto Rican cousin. Indeed, while I had long understood dembow as a direct DR response to Playero’s and The Noise’s seminal (proto-reggaeton) mixtapes, Mota shows that Dominican producers such as DJ Boyo had been concocting their own mixed up, hyped up version of Jamaican dancehall since 1993! In addition to showing how dembow has developed according to a distinct Dominican aesthetic, Mota also attends to critical questions of colorism, gender, and the importance of dance, including the importance of collective/solo “display” dances (i.e., not perreo) — and how such street dance videos on YouTube have been a major vector in the genre’s increasing popularity and reach. Of course, there’s a reason one might get the space for an article like this at this particular moment in time (though even then, this is of remarkable depth and substance): dembow is hot. The genre appears on the verge of a mainstream breakthrough, especially via the popularity of El Alfa, whose high profile collaborations with Bad Bunny and Cardi B have helped bring as much recognition to the genre as it perhaps has ever seen. One of the things that has always appealed to me about Dominican dembow is its intensity and weirdness: the density of samples, the rapid tempos, the rough, repetitive refrains. Dominican producers seemed content to pitch their music to Dominican tastes, raised on breakneck merengue, and — like Dutch bubbling — this made the music, by some measures, quite strange to outside ears and perhaps so esoteric as to resist further popularization, never mind appropriation. Whether Dominican dembow’s future parallels reggaeton’s remarkable path to mainstream success and influence remains to be seen, though I agree with the author that 2019 may be the year we find out. If Dominican dembow does take off beyond the DR, Washington Heights, and certain corners of YouTube, this article will provide an excellent guide as to why, when, and how.